Dhaka, Jan 3 (Just News): Bangladesh Nationalist Party chairperson Begum Khaleda Zia on Wednesday asked the government for ending killing of political dissidents. She made the call in bilingual tweet recalling the anniversary of the murder of leftist leader Siraj Sikder. ‘Patriotic freedom fighter engineer Siraj Sikder was extrajudicially killed while in custody for his politics on Jan 2, 1975, justice has not been done. The rulers kept murdering opponents after 1971 to stay in power permanently, but failed. 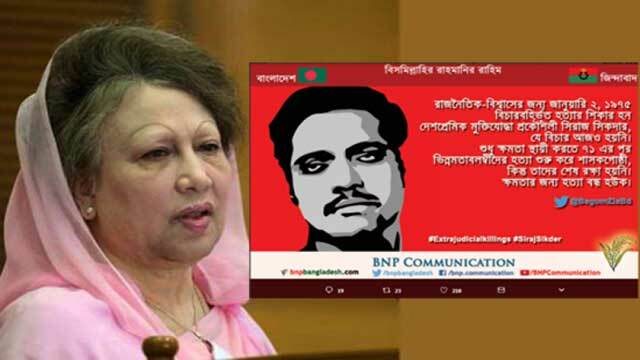 Stop killing political dissenters,’ Khaleda wrote in her tweet.